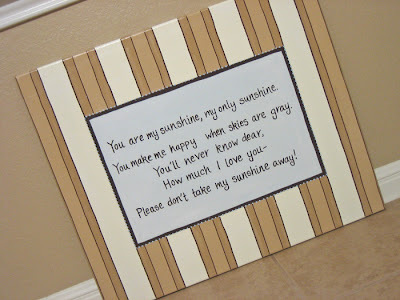 The request was for a picture with the words to "You are my Sunshine" on them. Mom and Dad aren't doing anything too "themey" so I stuck with stripes from the bedding. I think the colors came out great, and after Baby moves to a big boy room, this could easily be hung somewhere else in the house. Hope everyone has a good holiday weekend, I will be celebrating with friends at the lake!